[ #animation ]GOTHENBURG, Sweden – May 13, 2014 – Animation has a reputation for being tedious and complex. That’s why Craft Animations™ is proud to announce Craft CameraFx™, a powerful new animation tool for users who’d prefer it to be simple and intuitive. Designed specifically for camera animation, Craft CameraFx presents users with a layer-based workflow that helps them create a dynamic sequence in a matter of minutes. Craft CameraFx was inspired by Craft Director Studio’s “driving” workflow, and incorporates new abilities to manage cameras within a 3D scene. Traditionally Craft Director Studio users would have to use several cameras if they wanted to string together different effects. Now they can add multiple layers to the same camera and see changes directly from a set view to streamline the animation process. The software even lets users modify a sequence after it's made. No more re-staging and re-recording if you don’t get it right the first time. Tailored for easy customization and rugged professional use, effects in Craft CameraFx exist as small modules within its new layer system. 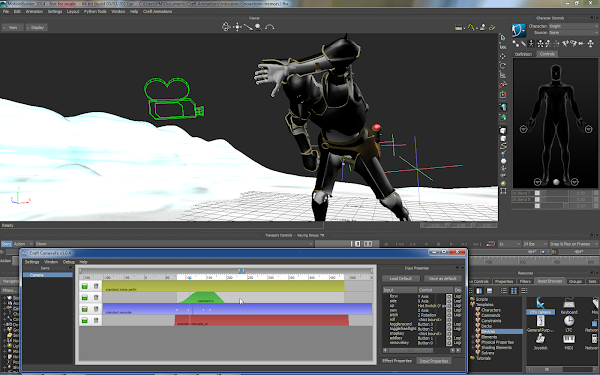 Module movement characteristics are generated in real-time and several can be stacked together for scenes that require complex animations. For example, a user might quickly set up a crude path for an object using a rough spline animation or other basic input. Adding one of CameraFx’s offset effects will then smooth out and extend curves on the path without actually modifying the source animation. This system was refined from specifications and requests from the Ubisoft Toronto team during the development of Tom Clancy’s Splinter Cell Blacklist, giving Craft CameraFx a true trial-by-fire in the AAA game market. Through elements like recording feedback, precise customization, and a variety of effects options, artists of all levels can now have unprecedented control over their animations. Craft CameraFx is priced at $1,995, and is available now for users of MotionBuilder 2012, 2013, 2014 and 2015. A purchase includes a perpetual license for the specific platform and host version of Craft CameraFx, as well as first tier support from Craft Animations. Users can access a trial of Craft CameraFx here.